Discussion in 'Planted Aquarium Tech' started by JButkus, Feb 27, 2017. Hey all, so I've had my 75g planted tank up for about a year now and while I am decent growth out of the current set up I feel this tank and equipment is lacking a bit, or could be producing more/growing faster (specs below). Im thinking about adding another two 54watt t5 ho bulbs to total at 4x 54watt 6500K bulbs. Any reccomendations or any tips on where to find a cheap 2 bulb fixture? I'm tempted to venture to homedepot or lowes and find a shoplight to throw on the tank. Secondly, I'm considering trying the EI dosing system for macro and micro nutrients. Has anyone tried this system before and mind sharing your opinion? Lastly, I feel like I need a better method of diffusing the co2. The kinda crappy fluval co2 diffuser was just what I had on hand, and want to hear others opinions on what diffusers to try or look into. Here are the current specs. filtration: fluval 306 canister filter with return spraybar. (roughly have it at 2bubbles/second. On an hour before lights, off an hour before lights shut off). 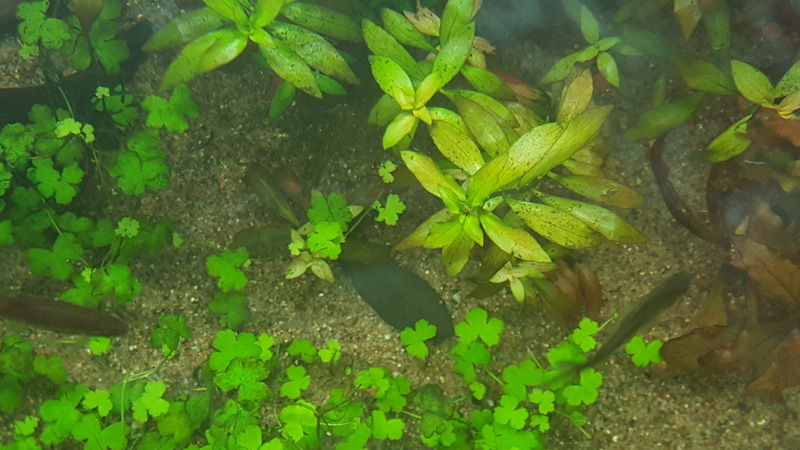 Flora: Ludgwigia (unsure of species), crypts, Rotala indica, Sagittaria subulata, Telanthera sp., plus a few other clippings and other odds and ends. 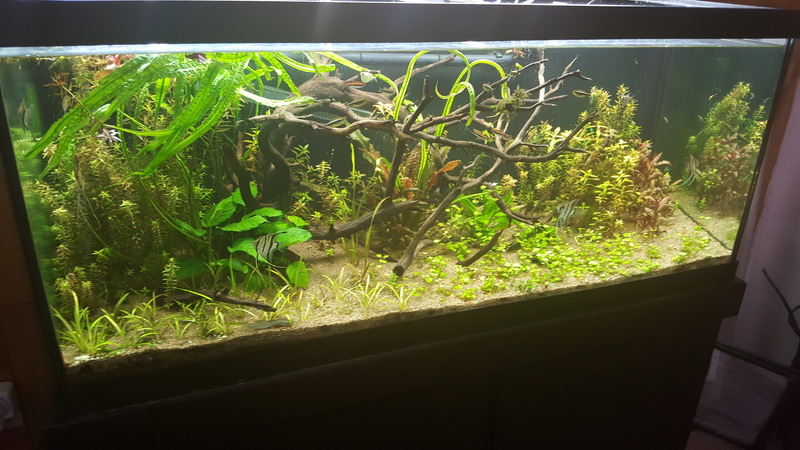 Nothing demanding I know, but would like to get into the more sensative stem plants or expand the diversity of plants in my tanks. Ideas, tips, comments on anything you would do differently would be appreciated. Here's a great read on EI dosing. There's also PPS pro dosing. Either way of dosing well grow plants well. Just have to pick the system that will be best for you. As for trying to grow more demand stem plant. It will depend on your currently setup. Mainly lighting, co2 levels, and importantly substrate. A good substrate will grow anything. You don't have enough light getting down to the floor of the tank. Don't look in the rear view mirror at anything that has to do with flouracents and do yourself a favor and get some LEDs. If you want something inexpensive take a look at the Finnex Planted+, the 48" model can be had for around $120 on Amazon and will get you good PAR levels at the floor of the tank. I would also try adding some nutrients to the substrate. Get some Flourish Tabs by Seachem and insert into the sand as per the instructions. Six weeks of that plus the increased PAR lighting should show you a difference. I would say that for ~ $20.00 you can get a cheap 2 tube 4 foot fixture and 2 6500K bulbs at walmart or home depot This will increase the par at depth, but you end up with added cost running the system. You will spend about 3 times as much in electric costs plus you have to replace the bulbs. LED fixtures, or DIY led fixtures are the way to go for long term low cost lighting. CO2. loose the spray bar. it is counter productive to increasing the co2 available to the plants. Do you know how to judge your co2 level by testing ph and carbonate hardness? test with the spray bar running and then test without the spraybar. Definitely in the plans to start EI dosing once I get some better lights soon! Thanks for the good read! I figured the two bulbs werent doing much in terms of depth. I have finnex leds on other tanks and love the light output on them, I've been using this 48" t5 HO simply because I already had it laying around, but for the desired results I'm looking for, it would likely be worth the cost to just add a finnex planted plus and eventually sell the t5 fixture and get a second finnex. I've always liked the subtle flow that the spray bar produces, however I see what you mean in terms of flow and relieving co2 from the tank with the spray bar, I'll be changing to the single return nozzle when I get done with classes later. I started looking into inline co2 diffusers as I really dislike the diffuser in the display, looks like something I will have to DIY since it does not seem like there are many commercially available/decent models available and they also do not seem terribly complicated, just need to work out how to attach it to the hosing on a fluval 305 canister. Has anyone tried osmocote plus tablets as far as root tabs go? I bought gelatin capsules and osmocote to give it a try but never got around to it, i can bring in a baggy of empty capsules to the next meeting if you want to make some. Can't find the osmocote, probably stuck under all the gardening supplies in my shed so you'd need your own osmocote. That would be awesome but unfortunately I will be in Tennessee during the next meeting for a collecting/fishing trip! I have found the blue light penetrates the water column. 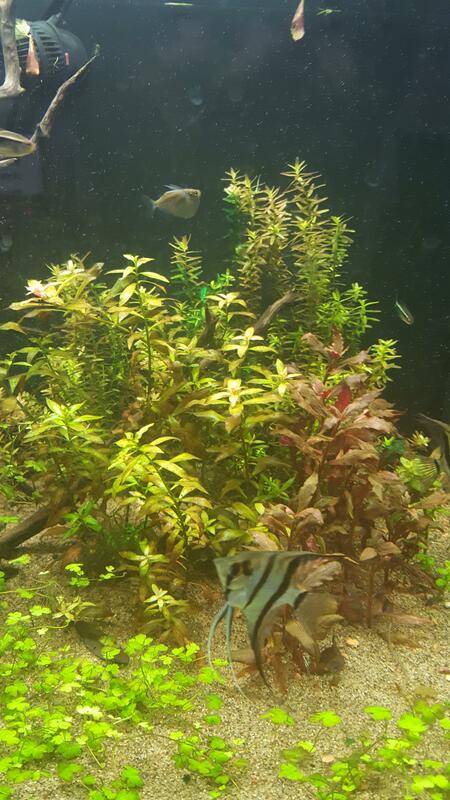 I have a 10000K and an actinic T5 over my 20 gallon and seems to be doing very well. Years ago I used the old T12 bulbs over my 55g, two cheap "grow tubes", one cool white, and one actinic with good results. As of lately, I have been using LED flood lights that are working nicely, but you need more room over the tank for them. Blue spectrum light promotes leafing and red spectrum promotes length and flowering. This is the reason most "grow" lights are heavy on the red spectrum. The yellow/green spectrum is for us to see.